While visiting the Bertolt Brecht archives in Berlin, Broomberg & Chanarin discovered a remarkable artefact: Brecht’s personal Bible. The object caught their attention because it had a photograph of a racing car stuck to the cover. 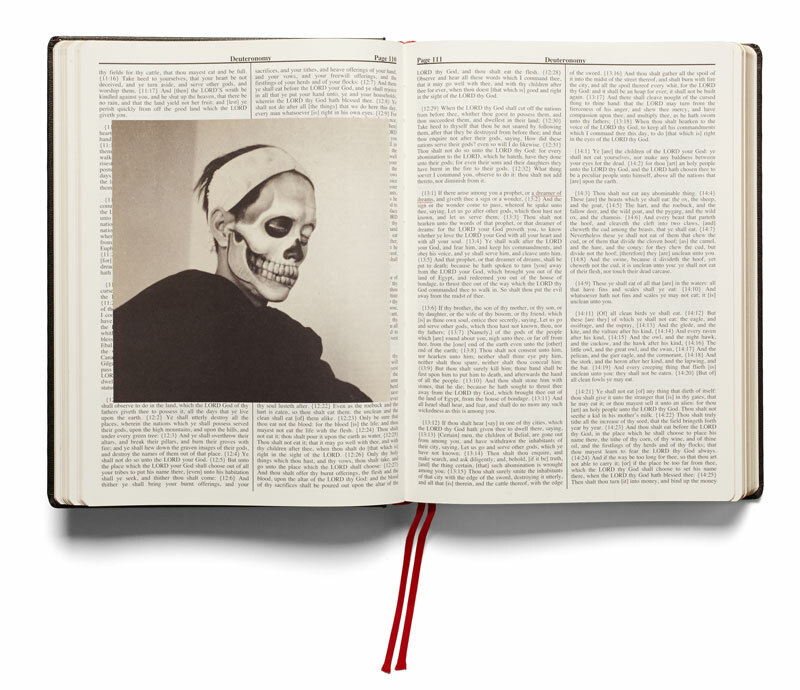 Inside the pages they discovered that the German play writer had used his Bible as a notebook; pasting in images, underlining phrases and making notes in the columns. This was the inspiration for their own illustrated Holy Bible. 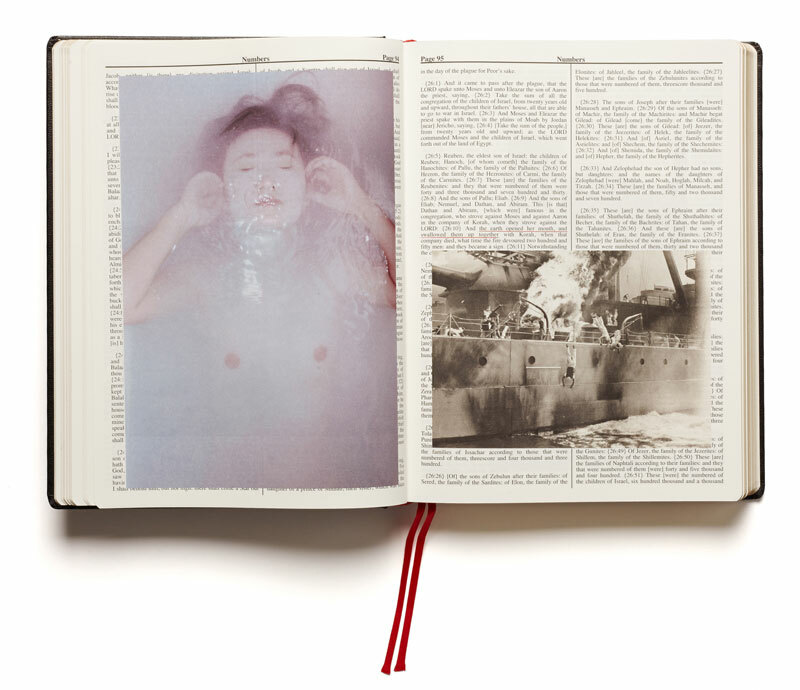 For this project, the artists have combined images taken from “The Archive of Modern Conflict” – the largest archive in the world dedicated to images of war – with phrases in the text which they have underlined in red ink. The book also contains a short essay by the Israeli philosopher Adi Ophir, who observes that God reveals himself in the Bible predominantly through acts of catastrophe. He considers the biblical text as a parable for the growth of modern governance. Adam Broomberg and Oliver Chanarin are artists living and working in London. Together they have had numerous international exhibitions including The Museum of Modern Art, Tate Galleries, Apexart, The Gwagnju Biennale, the Stedelijk Museum, the International Center of Photography, KW Institute for Contemporary Art, The Photographers Gallery and Mathaf Arab Museum of Modern Art. Broomberg and Chanarin are Visiting Fellows at the University of the Arts London. Their work is represented in major public and private collections including Tate Modern, The Museum of Modern Art, Stedelijk Museum, Victoria and Albert Museum, Musée de l’Elysée, The International Center of Photography, Art Gallery of Ontario, and Loubna Fine Art Society. 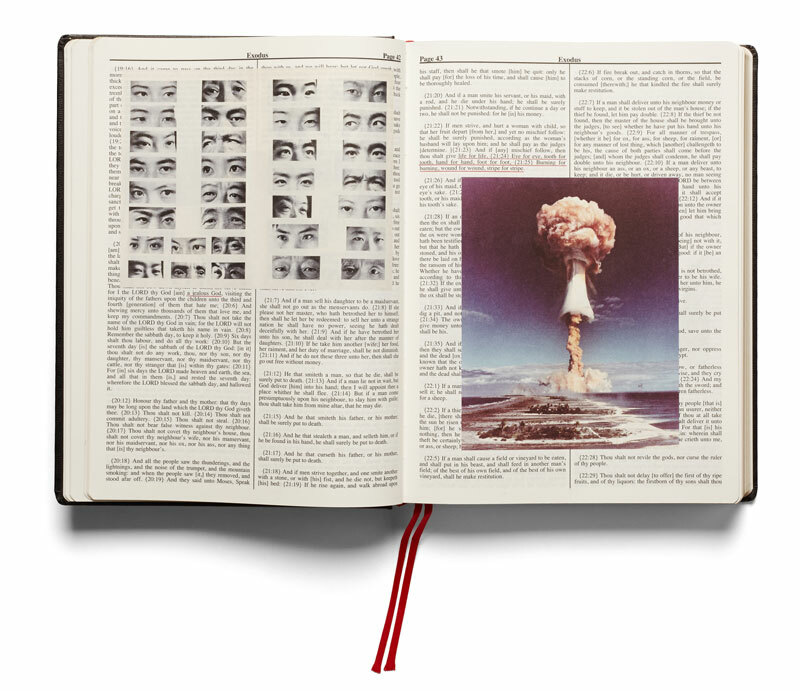 In 2013 they were awarded the Deutsche Börse Photography Prize for War Primer 2, and most recently they were awarded the ICP Infinity Award 2014 for their publication, Holy Bible.